Whether you have gingivitis, deep pocketing, or outright periodontal disease, LANAP can help. This new groundbreaking procedure takes periodontal treatment to a new level. No cutting, peeling back of the gums, or stitches will occur during this treatment. This laser, an Nd-YAG laser, is the only FDA approved laser for treating periodontal disease. 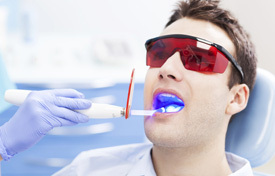 Any other laser treating periodontal disease is just not the same.